A friend once wondered why I'm so obsessed in so-called rewards card. 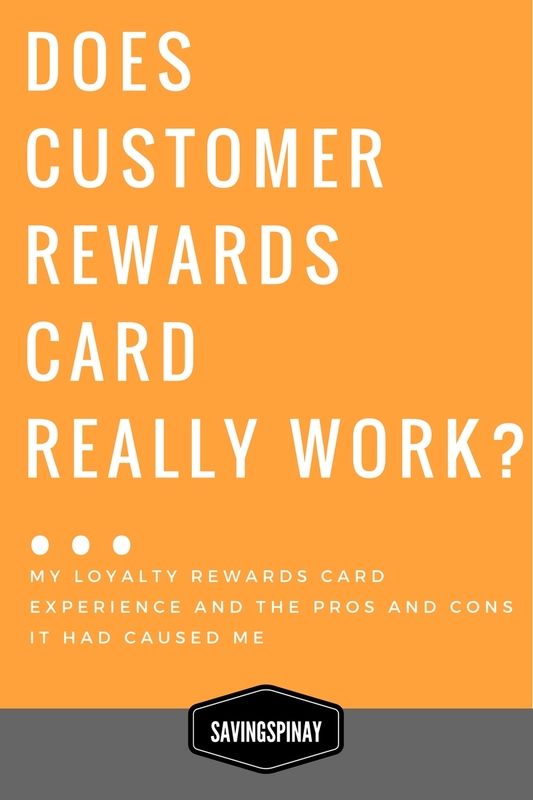 He told me that in a broader sense, rewards card and/or customer loyalty program doesn't really add value to the consumer but rather to the company itself. You buy to that brand and receive points but you can only that points to purchase the item on the same brand. His point make sense right? I honestly thought hard about his statement that night. I have shared countless posts on Rewards Cards that I own and my review for each but never have I seen his view. For me rewards card give additional value to the money I buy at the store. What my friend told me inspired today's post. I thought it'll be fun to share My Loyalty Rewards Card Experience and the pros and cons it had caused me. a I hope you find this post interesting. SM Advantage Card - This was the card that started my obsession with loyalty rewards program. The SM Advantage Card rewards members with points for purchases made in SM Department Stores, SM Supermarket and other SM Retail Establishments like Waltermart Supermarket, Watsons and others. How Much? The SM Advantage Express Membership Kit can be bought the cashier counter for 150pesos. How to Apply? You have the to fill in the application form and your personalized SM Advantage Card will be given to you in an instant. You can also apply online and receive a confirmation email on how to claim your card. How it Works? Depending on the store/partners you shop with you can earn 1 point for every 200pesos you spend. Other partner stores will requires 400pesos instead. Each point equals 1pesos you can collect and use as payment. Validity is one year only and you need to pay 100pesos for renewal as well as lost card. 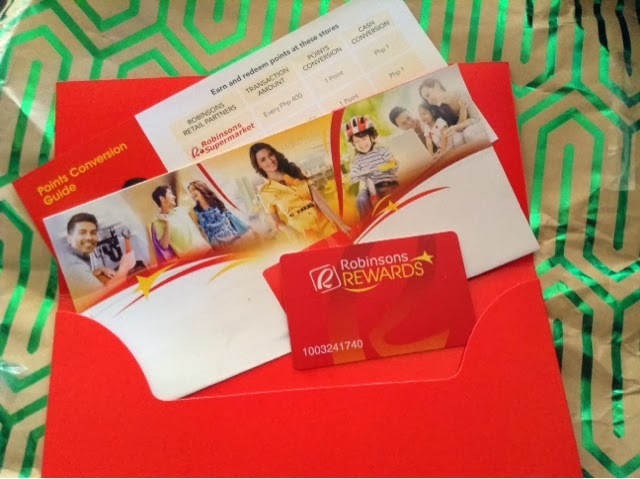 Robinsons Rewards Card- I got this card one December while I was shopping for Christmas gifts to my family members. I bought almost 1000pesos and I thought it would be beneficial to apply for the rewards card and convert my purchase to points. I have discussed about My Robinsons Rewards Card in a past post LINK HERE. How Much? The Robinsons Rewards Card is available for 150pesos. If you opened as part of your shopping cart or what you bought in the store, the total amount of your purchase and the membership fee will be counted as your first earning points. Cool right? How to Apply? Just like the SM Advantage Card you can own one at the cashier counter, fill up a form and receive your card in an envelope. SEE PHOTOS HERE. How it Works? You can use the card in all Robinsons Supermarket, Robinsons Department Stores as well as True Value. Again depending on the partner establishment you bought you can earn 1 point for every 200pesos and/or 400pesos. Each point is equal to 1pesos you can collect and use instead of cash. Validity is two years only and you need to pay 100pesos for renewal as well as lost card. Laking National Rewards Card- Well I just have to own this right considering the amount I spend buying different office materials and books at National Bookstore. How Much? Pay 100pesos membership fee at any National Bookstore Counter. Discounted fee of 60pesos if you are a student. You can also collect receipts amounting to 5,000pesos for the past 12-months upon application to receive the Laking National Card for free. How to Apply? You can buy the Laking National Card in any National Bookstore counter. Fill out the Membership Application Form and submit to the counter and immediately get your personalized card. How it Works? Every 1pesos you spend in National Bookstore entitles you to 1point. You can use the collected points to purchase you item. Validity is three years only and you need to pay 100pesos for renewal as well as lost card. Swirl Rewards Card from Coffee Bean - Bought this out of my loyalty to Coffee Bean Philippines. I super duper love their products especially the ice blended ones. I have a post on this one HERE. How Much? The Swirl Rewards Card is available for 195pesos and can be bought from the counter of any Coffee Bean Branch. With your Swirl Rewards Card you are entitled for the password of their WiFi. How it Works? Every 100pesos purchase of Coffee Bean product gives you 5points. Every point is equals to 1pesos. Validity of the card is forever meaning there's no expiration date at all. READ: My Swirl Rewards Card from Coffee Bean. My 7-Eleven Everyday Rewards Card. I got this card because opening is really free plus I go to 7-Eleven almost on a daily basis to purchase snacks and beverages. How Much? You can open your own 7-Eleven Everyday Rewards Card for 10pesos only. How to Apply? Once you have the card there is an intruction at the back. You may activate the card through text but if you find difficulties with this one just go to any 7-11 branch and they will be happy to freely activate your card. My HBC Beauty Rewards Card- A rewards card I got out of curiosity because it comes with a Secure Insurance Card upon purchase. Also the HBC Beauty Rewards Card give you a lot of cool benefits. And you know I have shared a lot of haul and product reviews of HBC Items right? Click HERE. How Much? Open an HBC Beauty Rewards Card for 50Ppesos only. I have blogged about the many things you do with your card HERE that includes special invite on "Exclusive Members Only Sale"
How to Apply? Available in every HBC stores near you. Just approach the counter, fill in the details of the application form and receive your physical card for use. How it Works? You'll get 2,000pesos loyalty points in an instant upon opening your card. This is equivalent to 10pesos e-purse. How Much? Again I got mine for free but if you will be applying for your own GetGo Lifestyle Rewards Card the one-time membership fee is 150pesos. How to Apply? You can easily apply online and via GetGo Join Page. Your rewards card will be delivered to you and it is packaged beautifully. How it Works? You will earn 1 GetGo points for every 5pesos you spend with Cebu Pacific or when you buy flight tickets. I have a detailed post about the GetGo Lifestyle Rewards Card by Cebu Pacific up in my blog. Visit THIS LINK for more information. 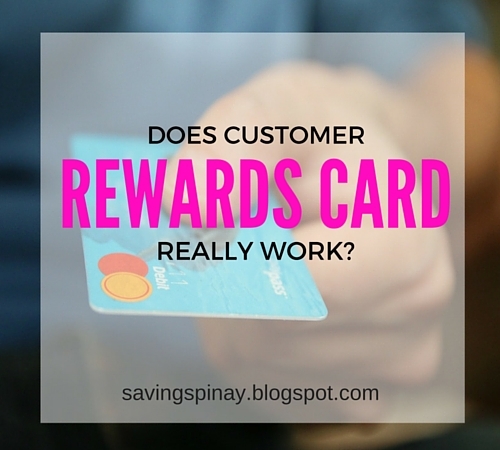 Does Customer Loyalty Rewards Card Really Work? The answer to this question depends per loyalty rewards card you own. I personally experienced and enjoyed the rewards from my Laking National Card, Swirl Card and Advantage Card for countless times. As per my other cards I will be honest that I don't use them that much and I even lost some of them like the My Robinsons Rewards Card. The thing about Rewards Card that lets you earn points for every shopping you make is that if ever a time comes that you don't have money at all or you are reserving your money for something else, you can buy the item you want like its free. I used the points I have with My Swirl Cards to treat myself with a nice meal at Coffee Bean. I used the points I earned in My Laking National Card to purchase the book I want to buy this 2016, Room by Emma Donahue. I used my Advantage Card to buy materials for my DIY Lightbox. So yes, Customer Loyalty Rewards Card and other promos do WORK. Only apply on brands, stores and establishments YOU REALLY USE. I have a Rewards Card for UNO Store which is the Retail Department Store of Waltermart but I only used it once and lost it. That's because I don't really go to Waltermart stores. Bring them with you like usual ATM or credit card so you won't misplace them. You'll never know when you can use them right. Almost all rewards card I mentioned above and others from well-known brands have sharing policty. Meaning, others can use your card so the points will be accounted to your card. It will help if you buy items in bulk especially on grocery from supermarkets. Maximize the perks that comes with your Rewards Card. Attend sales exclusive for members or any event/promo that the brand announced. It will be nice if you follow the establishment on Instagram or Facebook. PS. I am in no way affiliated to any company/brand mentioned above. This post is based on my personal experience. Do you also own any rewards card? What's your experience so far? Do you think they are give real benefits for us customers? Share your thoughts below.